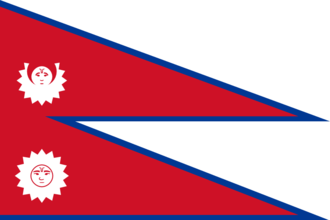 Nepal is a sovereign state in South Asia. It is a landlocked mountainous country in the Western Himalayas, Nepal borders the British Raj to the south, east and west,and Tibet to the north. To the east, it is separated from Bhutan by the Indian state of West Bengal. Nepal is not a major country and therefore shares the common generic national focus tree. Nepal starts with no National Spirits. As a Non-Aligned country, Nepal has a positive relationship with other Non-Aligned countries (+20) and a slight negative relationship with everyone else (-10). Nepal begins without any alliances at the start of 1936. Nepal, being a small, one state country, is a very small industrial power with only two civilian factories and one military factory. Its only resource is its 3 Chromium. Nepal has an extremely small military. Nepal's Military consists of two Mountaineers that are regulars. Because it is landlocked, Nepal has no navy. Nepal has no air force. Have a good strategy for Nepal? This page was last edited on 6 February 2019, at 16:56.